I don't want to make any complaint or blame it on anyone (I don't have the right either). I've been with DB for a while. I respect the members and players in our server. So I wish together we could find some solution. I couldn't even have a full hour playing in peace and really really tired when cheaters just keep coming back. If this problem is not resolved soon, I will give up my mod and leave DB. Finding an enjoyable SR8-only like DB is almost impossible, but I'd rather dedicate my time to a place where everything is well cared. I've told this to Revo several times about the current situation. However, he havn't replied yet. I am on the server probably 5 hours a day and trust me, I'm against hackers, trolls. After being away for 3 months I noticed my admin rank was gone. Now that I'm back I've requested Revo to return my Admin rank back so I can clear the ban request everyday, and stop the innapropriate behavior on the server. I have NEVER seen an other ACTIVE  Admin on for a long time. 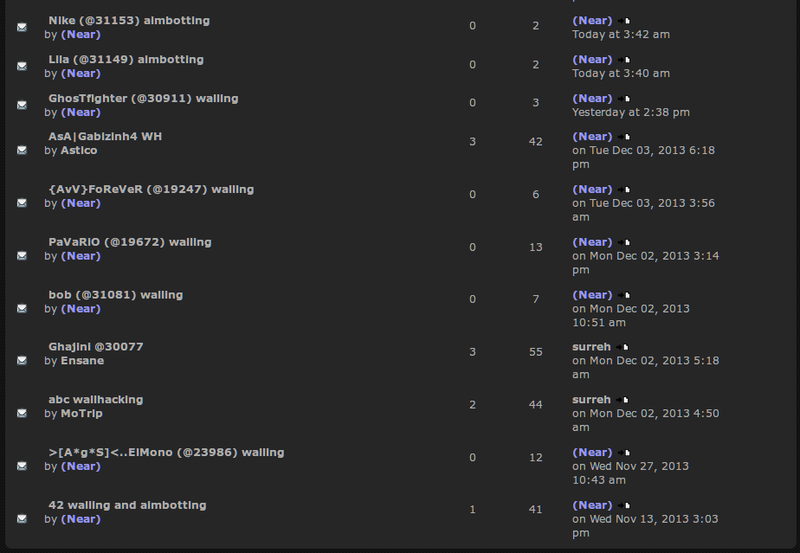 It's sad watching things get worst in the server as I play on the |DB| server everday and can't do anything about it. This is one of the only Sr8 Servers I have good ping on, and its becoming more and more annoying to play because of all of these hackers. Really the only admins i ever see anymore is Near and Evo. And Neither one of them are on during my mornings when Euro's rule.Its become near impossible to play in the mornings anymore, and barely tolerable into the evening. Yeah Pith. He hasn't replied to me either :-(. I know we've had differences but I'm glad to have you around. @Shadow: Timezone difference x). We need more admins/mods from NA and Europe :-(. As you probably know, I'm in Europe I haven't been playing, or even opened UrT for that matter, for a couple of weeks now (mainly because my mouse settings got messed up and I'm not bothered to spend time tweaking it again) but if need be, I can try to hop on whenever I'm able to and watch the server. Being a mod, I think there aren't enough admins (60+) who have the time to check the servers/websites everyday. Revo maybe you could promote people like Near, who have been with DB for a long time, so that the ban request list can be cleared and the server seen as being relatively hacker-free again. Near, considering the work you've done in my absence you've been put into the Full Admin group. Pith, as with everyone else, you must prove you're worthy of the rights. Due to the last incident we had, we aren't sure how to handle this. Thank you Rev :-). I'll do my best! Good on ya for making Near full admin (long time coming), but you need more MODs in the server. I was on the server the other day and a guy wallhacked all day long. It took your ppl 6 hours to respond (ty surreh) and by then the Wallhacker had done his damage. And he had been tb'd before for the same thing! The frustration level at that point is immense. I personally would appreciate some more MODs (there are VERY FEW during my time of play besides my occasional Near sighting). Please, Please give us some more MODs (who actually play). Your server is going downhill without them. Or at least more ppl checking your site for ban requests. Anyone got a place to upload demos? *Edit* You may have to make an account to upload. Thanks Shadow :-). I agree with the point Jebus made. Due to different timezone, more frequent mods are definitely needed. Can I help? Im lvl 20 Mod, and still member of DB. Welcome back Killer :-). The server needs yoooouuuu. Snype's kind of out of the loop Killer. Might be best to talk to Revo or Clear. Clear is working on the website, as it seems, sometimes talk to him on facebook. And does anyone still use mumble? Because always empty when i go on it. There's a ts3 server that I think they primarily use now. Could have sworn there was a post about it somewhere, but I can't find it now. OK then, let me officially plea for help..... Revo or Clear: your server has too few mods and your only cheat moderator (at the moment) is clear, who is not even in your clan. Please help us help you. I would like offer my help (If there were enough mods I wouldn't ask but there are not). If you say no I will not be offended. But please get some mods or I will move on. The idiots that cheat are numerous, so without moderation no decent players will want to play on your server. Catching hackers in-game should be reported to any mods or admins on at the time. Otherwise a demo needs to be taken, and submitted to a file sharing site like Mega, mediafire, etc. It should also be noted that there should be irrefutable evidence of said hacking, not just a "feeling" or one or two lucky shots. UrT is far from precise when it comes to hitcode, and with varying pings, it's not always a clean-cut case of hacking. In turn, the varying degrees of hackers are rising. Some are getting better, while some are not. If you ever feel suspicious about someone, don't be afraid to at least mention it to an admin/moderator. Though we may not respond, we will see it and we'll keep an eye on said player until they are determined clean or not.